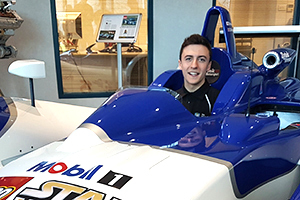 Sheffield Engineering Leadership Academy: Racing with Gibson Technology! On Wednesday, 8 March, SELA attended a site visit to Gibson Technology in Repton. From the minute SELA informed us of the visit to Gibson, I was filled with excitement and anticipation. Being an avid fan of motorsport and the automotive industry within engineering, I knew of Gibson as a renowned leader in motorsport engine manufacture. Hence I was incredibly enthusiastic about the opportunity to gain insight into the company and witness how it continues to hold its reputation for engineering excellence. The visit began with brief introductions as we entered the reception of Gibson’s facilities. Here was kept a Zytek 04S, an LMP2 car driven by Tom Chilton in the 2005 Le Mans Series and run by Gibson under their former name of Zytek. Many photos were taken of this impressive looking car, and the faces of every SELA member lit up when we were offered the chance to sit inside it. Shortly after, we met John Manchester, Director of Operations at Gibson Technology, who delivered a presentation to welcome us and introduce us to the standard and style of engineering carried out. We were walked through the history of the company, understanding the progression of Gibson within the engineering field into predominantly race engine design and manufacture. Following this introduction, we began a tour of the site factory. This was an eye opening insight into the accuracy of manufacture and vigorous levels of quality inspection of every part produced. Our tour guide walked us through the many steps each component goes through in manufacture, and astounded us with further facts about the precision required from the machinery to produce the high reliability looked for and expected in Gibson products. The site visit then continued onto an exciting demonstration of the testing facilities. A new engine was set up in one of Gibson’s on site dynamos, and run through a range of rev counts up to a maximum of around 10,000 rpm. The noise alone quickly drew the group’s attention, before an interesting explanation of what the tests of every engine look for, and the results this time round. John then took us through to the design offices. Here we began to understand the extent of the work that was carried out on both the design and simulation of Gibson’s products. Discussions with each employee we spoke to instantly made clear the passion and love for the industry that is poured into any work carried out. It became obvious that Gibson maintains its high reputation for excellence through the dedication and devotion of every individual to the company. Finally, the tour was rounded off with a question and answer session in the conference room. John was quizzed on a range of both technical and broader career-related questions. 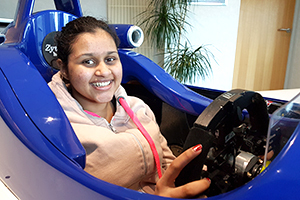 Hints and tips of how best to pursue careers in cutting edge and competitive industries, such as engineering in motorsport, were drawn and invested into the group. On reflection, the overall experience was incredibly valuable. A great deal was learnt by all, not just those with a keen interest for the motorsport and automotive industries, about the passion, knowledge and devotion that is packed into work carried out by elite engineers at the forefront of engineering fields. Our understanding of the importance of personal skills such as networking and career planning, which are discussed and developed regularly within SELA, was emphasised through explanation of how the company and its employees had progressed to where they are now. Not only was a wealth of knowledge gained through the visit, but a fresh wave of inspiration was installed in us to continue to chase our goals of attaining careers in the industries that excite us most.